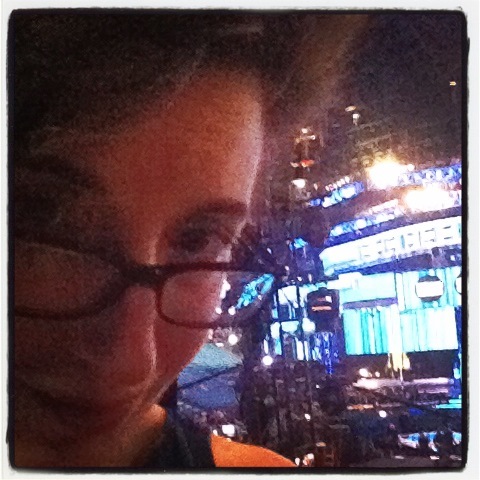 Last week, I got to go to the Billboard Music Awards. I’d actually never been to a broadcast awards ceremony before, and even though our Love in Los Angeles books aren’t about the music scene (although there’s a guy in a band you’ll meet eventually), texting with Erin during the commercial breaks as some poor radio DJ worked hard to keep the audience enthusiasm up was an experience both a little weird and a little spooky. 1. If you’re not important, the date of someone important, or someone helping to manage traffic flow and get everyone to their seats on time, you don’t get to walk the red (or otherwise colored, but still special) carpet. 2. Seat fillers run around sitting in empty seats when people get up to go to the bathroom or get a drink. It’s a cool way to see the show, but those people work hard. 3. You know who else works hard? The audience in the pit by the stage (a staple of music awards shows, it seems). There aren’t that many of them, and they have to look enthusiastic and in awe for every performance, while not being weirded out by the cameras right on top of them or their proximity to the crotches of many performers. You think I’m joking. Never. 4. Meanwhile, the TV broadcast has the highest priority, so cameras, cranes, and other equipment may block your view. 5. During commercial breaks, every thing is dead quiet, unless there’s someone on stage trying to keep the audience’s energy up. 6. But if you’ve ever been a stage manager, you will be in awe at the skills and efficiency of the technical and production crew. If you haven’t, the evening can get long, quickly. 7. No matter who you are and what you do, there’s something about that countdown to airtime that will leave you breathless with excitement and maybe even a little bit emotional. 8. You know those announcements of the other awards that were handed out prior to air time? Well they don’t do that at the live show before it goes on TV so it really is just a scroll of names. For some awards shows (such as many technical awards at the Academy Awards), there’s a separate ceremony and event, but it sure seems like sometimes people must just get a trophy in the mail! As a culture, when we talk about fame, there seem to be two arguments. One, is that it’s the best thing ever. The other, generally, is about how it’s a deeply destructive force. In some ways, both those things are true, but as far as I can tell neither accounts for the hours of being shouted at during awards ceremonies to clap harder, as if you’re the only thing real in a world made of Tinker Bells. This entry was posted in fame, Love in Los Angeles, Starling, tv and tagged fame, Love in Los Angeles books, Travel, tv. Bookmark the permalink.